Anyone who has tried their hand at RPG Maker 1 (or any text input with a controller) knows how difficult it can be typing long paragraphs into the console. [Thutmose] is here to save the day with Kupid 1.0 (2.0 in production). A PICAXE takes ps/2 keyboard input and converts it to a series of d-pad button presses for PS1 and PS2 controllers, providing quick data entry compared to the previously monotonous task. We’re happy to learn that the source code and hardware is released, meaning it has the potential to be easily adapted to any controller/console. people still use RPG maker? That was only good for poor kids, back-in-the-day, that couldn’t have their parents buy them a PC. Very nice, of course any serious RPG Maker fans will be using the various, much more sophisticated and capable computer versions (not to mention distributable). Though RPG Maker 1 for PSX does bring back fond memories. Are they using hookup wire to connect directly to the buttons, or are they reading a chip on the controller? The schematic wasn’t clear to me. Why not use a USB Keyboard? Giulio: because PS1’s don’t have USB, nor do they have any method for inputting characters. They were never intended to have keyboards plugged into them. Theres also PS1 emulators that works perfectly. This project would have been much neater if it would have emulated a controller instead of soldering in on the buttons inside one. This is a HACK. Of course you could implement the protocol and hook it up directly to a PSX. But because you need the connector, you can also just take that old digital-only psx controller and solder directly to the buttons. Much faster, easier and not more expensive. @t&p & xio2 – There is still an active community of RPGM1 users making games. While I like the PC makers better personally, for a number of reasons, it’s still charming to see people use the old console makers – akin to someone writing games for a C64 today. Users of RPGM like the software, like to experiment and push the limits just to see if they can. It has it’s own character and intangible qualities that you just don’t get with XP or VX, or the other makers. I created Kupid to help support these people, so that they can continue doing what they love. 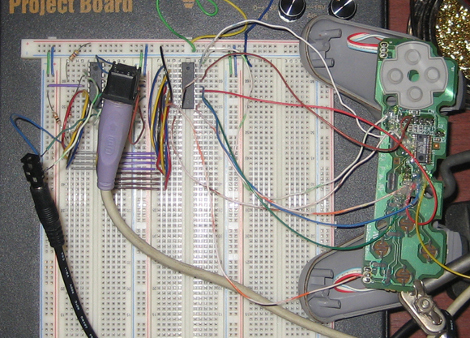 @Nick McClanahan – The wire is hooked up to the button traces on the PS1 controller PCB. For each button press, the PICAXE uses corresponding darlington array pin to bring the trace to ground, which the PS1 MCU reads as a button press. @Henri – Version 2.0, that I’m working on now, will use an MCU to emulate the PS1 controller, so it will hook directly up to the PlayStation, rather than piggy-backing off of a controller. But stealthmonkey is right. It was a heck of a lot faster and easier for me to solder to the button trances that it would have been to emulate the controller right off the bat. I learned a lot doing it this way, and consider it a stepping stone to more complex projects. @Giulio – Cost is a major factor. I wanted Kupid to be as cheap as possible, and making it USB compatible would be expensive. Further, USB keyboards use more power than PS/2 keyboards, and there is very limited power to work with. Hi to all visitors thutmosesworkshop.com forum. I want to share with you the latest news about MTV Video Music Awards. Please move topic if forums “http://hackaday.com/2010/05/20/keyboard-input-for-playstation/” was not chosen correctly.